UPDATED DEALERSHIP LOCATION STILL OPEN? STILL STANDING? Next to Rollins was Cofer Motors that sold DeSoto & Plymouth cars. Nick Allen Buick was on the N/W corner of 30th & Huntington across from THE SCHOOL..
but it may have been part of Cofer's too. Bowler's Auto Exchange on 35th & Huntington sold Kaiser & Frazer cars. 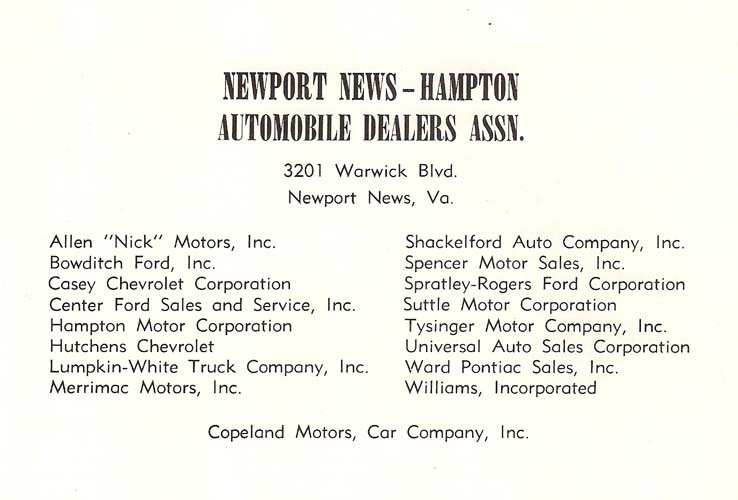 to Warwick Boulevard after the 1958 consolidation of Newport News & Warwick}. There may have been more dealers downtown but this is all my tired brain can recall right now. helped shape not only the local scene but nationally as well. Here is a brief history of the local automotive dealers. Abbitt Chevrolet became Casey Chevrolet in the late 50's when Washington DC businessman Arthur M.
Chevrolet and many others cut their automotive teeth there. by the late Bill Wiley who also owned Tidewater Dodge in Norfolk. It is now Oyster Point Dodge. Casey Group and the franchise is now known as Casey Buick on Jefferson Avenue and Morris Boulevard. known as Hudgins Ford and is now owned by Hall Automotive. Boulevard before moving to 11061 Warwick Boulevard. The original Tucker franchise was on 34th and Huntington and M. P. Breon was the unfortunate dealer. of the strength of Suttle Oldsmobile Cadillac in Newport News. Bowditch Ford was originally at Harpersville Road and Jefferson Avenue and trading as Bill Bailey Ford. Bowditch moved to the present location on Warwick Boulevard in the 60's. moved to Mercury Boulevard and now operates as Freedom Ford. operates dealerships all over the region. Bing Burford operated Burford Buck on North King Street. These are just to name a few and many lives have been shaped by the automotive industry in our country. It's great to see the interest shown in the history of Peninsula dealers. Enjoy the day. she said baby, can't you see. Yes I'm gonna be a star. and baby I love you. and she said baby, it's understood. and she said listen babe I got something to say. but I've found a driver and that's a start.